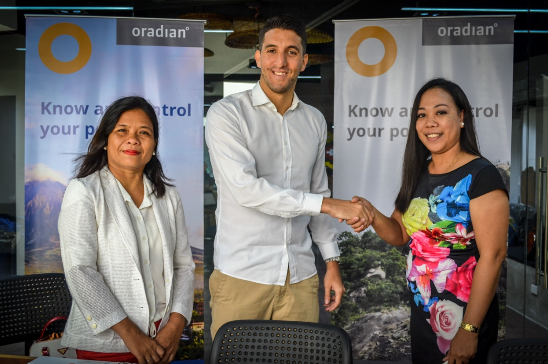 Another entity in a hard-to-reach community in the Philippines will soon benefit from the technological services offered by Oradian, a global company that provides a cloud-based toolset for financial institutions that are looking at growing and reaching a wider customer base. This comes after the Micro-Entrepreneur’s Multi-Purpose Coop (MEMPCO) engaged Oradian’s Software as a Service (SaaS) Model during a contract signing held recently at the Oradian headquarters in Makati. Present during the signing were Oradian’s Business Development Manager Yarden Bilovich, MEMPCO’s General Manager Ms. Eleonor Santiago-Dillena and Board Chairwoman Ms. Melecita T. Sajili. MEMPCO is a savings and credit cooperative based in Zamboanga City, Zamboanga Del Sur which started operations in 2002. Bilovich welcomed MEMPCO to their growing roster of clientele saying that Oradian simply wants to empower cooperatives as well as rural banks and micro-finance institutions so they can keep up with the demands of digital transformation. Dillena, meanwhile, is hopeful that with Oradian’s expertise in cloud technology, they will be able to thrive more and assist their members better, faster and safer- without the burden of incremental costs. Oradian is a financial inclusion company serving financial institutions in remote, hard-to-reach communities. Using insights from our community of customers, we build a cloud-based toolset that smart financial institutions plug into to access best practice and efficiency. Oradian’s global community is made up of over 50 financial institutions in seven countries with a concentration in the Philippines and Nigeria. Collectively, Oradian’s partnering financial institutions provide access to financial services for over one million end-clients.